Enclosure for Vifa 4" midrange driver? My application- MIDRANGE driver, 180 Hz- 3.15K active xover 24 dB/oct slope. Midbass - 8" Silverflute woofers. 180 Hz down. A) Build a sealed enclosure, if so what size? B) Should I simply leave it the way it is now, sharing a common airspace with the Silverflute 8" mids. Help! Definitely build a separate enclosure for the mid. This serves two purposes. (A) it stops the frequencies from the bass unit coming out through the mid cone. It stops the bass modulating the mid cone and allows the Vifa to concentrate on the mids. (B) a separate mid enclosure will allow the bass unit to function as intended. If you don't separate it from the bass unit the mid will act as a small "Drone cone" or auxilary bass radiator to give it its proper name and this will alter what ever type of bass loading you had planned. As to the size.....well anything around 2-3 litres should be good. It won't be too critical. Now there are some general guide lines to help reproduction. (i) Assymetrical enclosures are good in that if you avoid parrallel sides you get less standing waves in the enclosure and this should make the mids clearer. (ii) make the box thick enough to prevent bass frequencies getting through. Put some sort of fibre in it. ie BAF etc. Now I have found a cheap and simple solution is to use terra cotta flower pots. These come in a variety of sizes, are acoustically "dead", are readily available and already have a hole for the leads/connecting wires. Saves a lot of time. See your local garden supplier. You have to then ensure that ou can attach it to the back of the baffle but there are various ways you can work that out. If you are doing detailed and accurate calculation for the bass unit you need to deduct the volume of any mid range enclosure from the box size to make sure you ave the right volume for the bass driver. Sound like a really good system...hope it works well. Makes sense. I'll spill the beans this is actually my car stereo setup. The doors right now are the "enclosures". The picture is a very early shot when I first did the install 2 years ago. 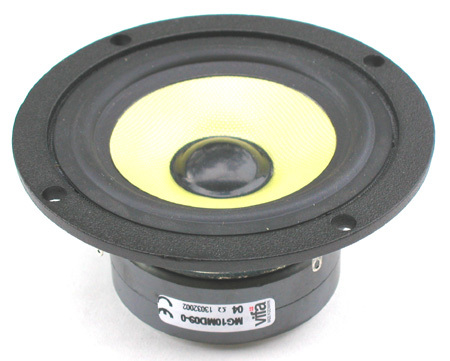 I'm considering also making enclosures for the woofers, but that may be hard to do with the window mechanisms etc. The midrange should be easier since the enclosures don't need to be that big. If I do the woofer I want it to be .5 cubic foot (14 L). The issue I'm having right now is the system sounds great, but there's always room for improvement. I'm getting a rather large (10 dB) spike at 1 Khz I have to EQ out. I'm hoping this is cause the midrange is not enclosed right now. With an enclosure this should clean up the midrange and bass. I clicked on all the links and nothing happened and I can't read french. What does that site do? Okay....alright......I give up.....what about a very, very, small flower pot!!!!!!!!!!!!!! I haven't gone in and measured yet but I think I will be able to use a PVC pipe of the right O/D and attach it to the baffle using fiberglass or something similar. Then use a cap at the end. Weekend project here we come! If I'm lucky I may try to do an enclosure for the woofer. Well I've done some calculations. The best I can get for the midrange enclosure short of doing major modifications to the car is about .5 Liters. Its much smaller then 2-3 Liters recommended. Any thoughts on this? I guess the only way to find out is to try it. nice install...i like it...8" in doors...damp the doors yet? or cover the holes yet? Thanks, the pic is an early one I had conveniently hosted already. That pic was before I sealed the doors, replaced that access cover with a sheet of braced MDF and before I treated the MDF with Spar Polyurethane.n The damn door still rattles though and its high passed at 60 Hz for the sub which is in the rear of the car. i made some door enclosures from 6" pvc elbow joints once , cut to the proper angle...it had a peak around the same freq as you. since the pvc has a similar pitch to 1000hz when i tapped it, i took silicone and lined the entire interior with it, took off the back and laid aluminium tape across the back and siliconed over it. something similar to a aperiodic membrane, ringing went away with silicone.